As a self-taught photographer, Shanghai-based Tim Gao learned to develop films in the darkroom. With a keen fascination for Henri Cartier-Bresson’s photographic style, Gao began his professional experience doing street photography in 2012, being influenced by photographers including Nobuyoshi Araki, Daido Moriyama, Diane Arbus, Josef Koudelka, Mark Riboud, Takuma Nakahira and Issei Suda, among others. 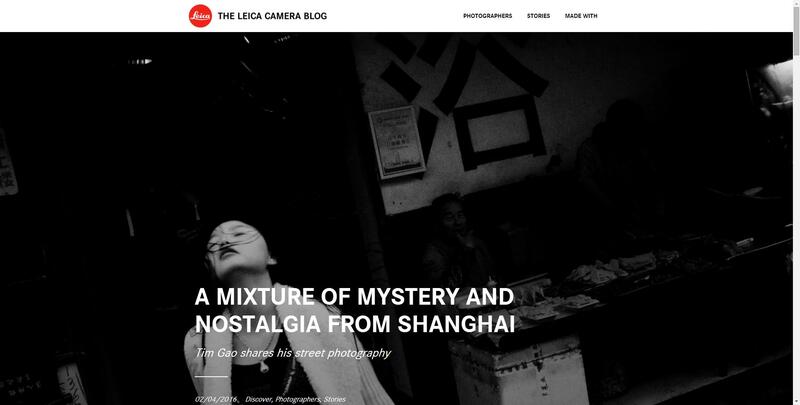 Although Gao is yet to get involved with Leica cameras, his work shows the exquisite craftsmanship needed to obtain street photography, specially with film cameras. How would you describe your photography? With a curiosity in the world, I find my passion on street photography. Street photography not only enables me to create a documentary view of the unique Shanghai streets and the culture behind it, but also reveals the extraordinary and metaphorical aspect of Shanghai – a mixture of mystery, nostalgia and unease. When did you first become interested in photography as a mode of expression and art form, a profession? When I was browsing around the college library in a sunny afternoon, I was deeply touched and got shocked by one photography book of Henri Cartier-Bresson. I still remember there was a comprehensive photographic collection of his works, including images of Shanghai in the late 1940s, in a straight and yet humorous way. That was around 2009 and one year later I got obsessed in taking street photographs. It was until 2012 when I started thinking of taking a photography project seriously. Since then I have been persistently shooting Shanghai’s streets. I would rather consider taking these photographs as a form of private diary than a pursuit of art. I walk in the streets and take snapshots around me in a quiet relaxed manner. I feel enlightened. What approach do you take with your photography or what does photography mean to you? Street photography is not just a sharp triggering of the shutter to shape the outside world in the form of light and shadow. It is simultaneously a curious observation and emotional perception of what’s happening in the ordinary streets at any moment when unpredictable dramas and realities are actually taking place. As for Shanghai, I have lived in Shanghai for over 9 years and I always try to explore Shanghai, where urban city and residential lanes (also known as Longtang) are hidden and unknown to me, and introspect my emotional attachment to the city. Photography is personal intentional media and a diary book about my feeling of curiosity, mystery and nostalgia. Besides, I find it a magical experience of street photography that when clicking the shutter, not only the present, but also the past of the streets where the imprints and smells of daily life remain, is frozen. Stories continue when the viewer, with their private imagination and feeling, come to see the final print of the photograph. What equipment did you use for the Shanghai Story and how were they processed? The metropolis is transforming, the light is changing and my cameras are changing too. The gear I use for these images of Shanghai are various, from the earlier analogue cameras like Konica Big Mini F with lens 35mm f/2.8 and Nikon FM2 with lens 50mm f/1.4, to current and yet compact cameras like Panasonic GF2 with lens 28mm f/2.5 and Fuji X100s with lens 35mm f/2. In terms of the analogue negatives, I tried and learnt to develop the Black & White films by myself and later I just sent them to the developing lab with standard process. Now I am mainly shooting digital photographs and process them with Photoshop instead of spending more time in the darkroom. However, I am open to all kinds of equipments and one of my dreams is to own a Leica camera and bring it to Shanghai’s street. How do you see Shanghai street photography evolving, compared for instance to portraiture photography? It is a big and complicated question indeed. The boom of Shanghai street photography began, as far as I know, around the 1980s. A great amount of valuable historic images on Shanghai street and daily life were recorded by local reportage and documentary photographers such as Zaiqing Tang, Jianhua Gong, Xixian Xu, Jie Lu, Yaodong Wang and Zheng Gu. At the 1990s, a new generation of local photographers like Yuanmin Lu, Ming Zhou and He Yong continued to shoot Shanghai street photography. At that time, new ideas and critiques on traditional photography, with standard composition and aesthetic, actually began to emerge. There was once an un-official photographer-like-minded group named Bei He Meng (meaning Northern River Union) in 1986. They emphasized on personal perception and expression of feelings on Shanghai and daily life. Among them were Yaodong Wang and Zheng Gu mentioned above. One of my favorite photographers above is Yuanmin Lu. With a thorough understanding and familiarity of Shanghai, his street photographs try to reveal his intrinsic and emotional experience with Shanghai. Nowadays, younger generation of Shanghai street photographers and enthusiasts are documenting Shanghai and creating their imaginative works in a versatile and experimental manner. Is there anything else you’d like to share with the readers, maybe other projects in the pipeline? One of my next projects is trying to create a series of portrait photographs with my understanding and introspection of what does Shanghai mean to me. Moreover, I am wondering what will happen when I mix the street photographs with the portrait ones. Copyright © Tim Gao Photography, all rights reserved.